The Pig "offends" and also "tortures" the Tai Sui in 2019. This brings about major upheaval, bloodshed, injuries, poor reputation and undesired changes in life. Drastic changes will be observed in wealth, career, relationship, living environment and health. There are many setbacks to your business and career. On the upside, for those who are in the management level, you are backed by the Tai Sui, it is rest assured that your managing position will not be threatened. But you will be very unpopular among your subordinates. Contributors will often have disputes with your colleagues and boss. You are particularly prone to gossips, arguments and deteriorating human relations. Crisis after crisis will occur. Crisis implies troubles, obstructions, failures in investments and blood mishaps. Therefore this is going to be a non-fruitful year. You do not have strong lucky stars in sight, meaning you are deprived of any favorable energy. Evil stars charge in relentlessly to cause havoc, pitfalls and misfortunes. First and foremost, you have Jie Shen star (Relief God) and Tian Jie star (Heaven Relief) that will turn problems, disasters and mishaps into good luck. You may start off badly in the beginning but will eventually get solutions at the end. However, this also means that even if there should not have been problems, these stars will create havoc for you in order for them to exercise their duties to help you solve the mess later. On the downside, Zhi Bei star (Back Poking) denotes hypocrites who incite hatred in order to pull you down. It will bring you troubles and turbulences caused by backstabbers and rumor mongers. They are everywhere around you to run your name down. Backstabbers who blindside you instead of head-on confrontation are hard to shield. Foreseeing unfavorable career and finances ahead, the Di Sha star (Earth Killing) denotes troubles that will derail your plans. All your undertakings including your financial, love, health and career plans will be potentially messed up and not follow the planned schedule. Additionally, another similar Xue Ren star (Blood Knife) will cause bloodshed due to metal objects, therefore you will need to exercise vigilance at all times when handling knives and sharp metal objects. Next, watch out for water sport and swimming activities because of the presence of Fu Chen star (Float and Sink) that denotes possible water related accidents. It will also slow down your progress in everything you do by making you go back and forth in all undertakings without really advancing. The unlucky Jien Feng star (Sword Edge Star) will cause accidents and injuries, especially related to metal objects. You are susceptible to various dangers, surgeries, bloodsheds and accidents. You will need to be vigilant when travelling. It is the best time to do blood donation or scale your teeth this year to pre-empt the destined bloodshed. Next, family squabbles will be caused by Fu Shi star (Hidden Corpse) because of your words and actions leading to conflicts. Jien Feng and Fu Shi stars actually follow the zodiac that offends the Tai Sui every year. It is the best time to do blood donation or scale your teeth this year to pre-empt the destined bloodshed. Very poor health is indicated. Your relation with others will be extremely poor coupled with many disputes and arguments. It will inevitably cause tears in your relationship and a possible break-up. You will be distracted with many negative emotions leading you to troubled relationships and possible break up with your partner. Your emotional instability will lead you to offend others unknowingly. Singles will be lonely and self-centered. Tai Sui - Carry along with you the Tai Sui Talisman for protection. Display the Tai Sui Plaque in the NW. Display the Pi Yao Appeasing Jupiter at your work desk or by your bed. Use the Pi Yao Abacus Amulet to obtain fortune. Offend White Tiger (Neutralize Villain) - Display the Red Robe Laughing Buddha in the west (direction of relationship). Display the Three Fireballs in the south (direction of gossip). Activate Happiness Star #9 and Career Enhancement - Display the 9 Carps Plaque in the NW of your living room. Carry along the Heaven's Flag Amulet in your work bag. Catalyze and Safeguard Wealth - Display the Mantra Enhanced Pi Yao facing the main door. Neutralize Troublemakers - Keep in your work bag the Chundi's Fan-Mirror. 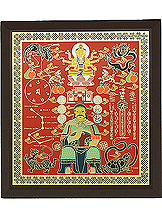 Eliminate Disasters/Accidents - Hang in your car the 8 Immortals Coin. Health - Display the Twin Wulou by your bedside. Love Enhancement - Display the Nine Tailed Fox Amulet at the knob of your bedroom's door.